Dips can be very satiating. Admittedly, This is a very controversial topic. What I will tell you is it is better to tip in those dressings and sips than to pour. If you love creamy dips and sauces, don’t cut them out of your food plan completely. Just limit your amount or chose a low-fat soft cheese and mayo instead of the full-fat option. If you completely deprive yourself, you will be more likely to overindulge, so just limit your intake. The bottom line: It is better to limit your intake than deprive yourself completely. 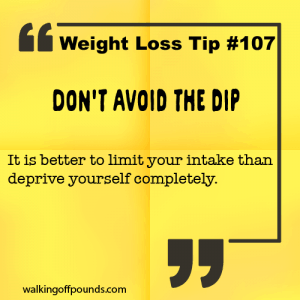 Be the first to comment on "Weight loss tip: Don’t avoid the dip."